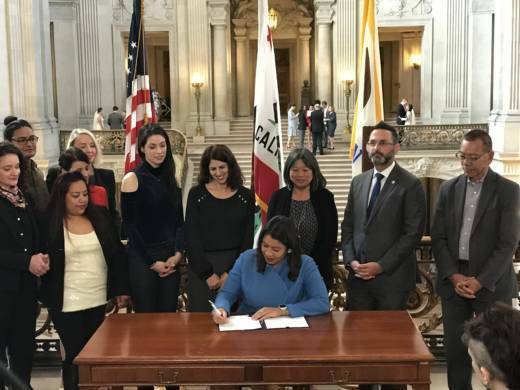 San Francisco Mayor London Breed on Thursday signed legislation creating a new office that will hold city departments accountable for their handling of sexual assault cases. The Office of Sexual Harassment and Assault Response and Prevention (SHARP) will assist victims who file complaints against city departments that have turned them away, sometimes due to insufficient evidence. San Francisco Supervisor Hillary Ronen introduced the legislation earlier this year in an effort to battle sexual assault and sexual harassment across the city. Currently, victims file reports with the respective city offices they feel will best handle their case. But many who have already struggled with coming forward say it has been difficult to navigate the different departments and to also have them follow through with their case. "Many women who were coming forward were getting brushed off, disrespected and not believed," Ronen said. "We want to let them know that we are taking this seriously and supporting women in getting justice and helping them move forward." Rachel Sutton-Zader is a victim who helped Ronen draft the legislation. "To see something come out like SHARP is probably like a light at the end of the tunnel, honestly. It, you know, is sending a message, but it's also doing something that's actually hands-on to change the state of things, which are abysmal," Sutton-Zader said. Sutton-Zader filed her case with the San Francisco District Attorney's Office in early 2014 and was denied. She said she had to request a meeting with the district attorney several times to find out why the office wouldn't take her case. Recently, Sutton-Zader was told by the DA's office that her case will finally be moving forward. "Jane Doe" is another victim who has come forward and also helped draft the legislation. "The SHARP office will be a source of advocacy and accountability that shamefully we lack in San Francisco," Doe said. The San Francisco Human Rights Commission will appoint a director with the help of a three-member advisory committee. The SHARP office will have an annual budget of $400,000. "Seeing the hope of other people around me, who have also been victims who are survivors, it's been, you know, life-changing because I know this has affected everyone in the same way," Sutton-Zader said. "And to see something like this turn everything around almost overnight -- it really feels great."